Stand-up comedians experiment in night clubs. They try out different things on small audiences, to see how people react to it. They try different things on different nights to hone their act and to see how the audience reacts. Seems to me that Twitter is a great place for an SF author to do the same thing. One such experiment is going on right now, called #9898. I’m not going to tell you anything about it. Go read it. It’s being updated daily, and may in the future be updated weekly (we’ll see how the experiment goes). If you’re reading this long after it was written, check out the tag: #9898. Here’s my Twitter, check it out: Vision Etc. 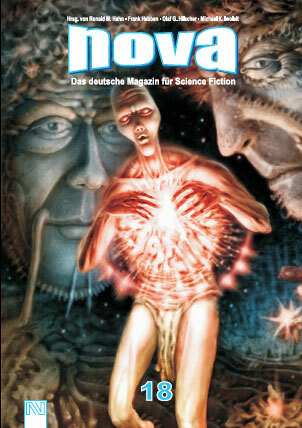 The short story, ‘The Assassination’, has been translated to German and published in Nova. This issue of Nova is a special Middle East issue, feature a story by Lavie Tidhar, Achmed Khammas, and myself, and an interview with all three of us. The Assassination is about an old man, an old hero, who has built his entire life around a deed done in his youth. But thanks to time technology, he can look back and learn the truth about his deed. In the story, the personality he has built upon his heroic deed in stripped away, step by step, as he slowly finds who he really is and who he always was. My recent short story, ‘Generation E: the Emoticon Generation‘, was used in an academic class that goes under the title ‘Language Studies in the Digital World’. #Ping!